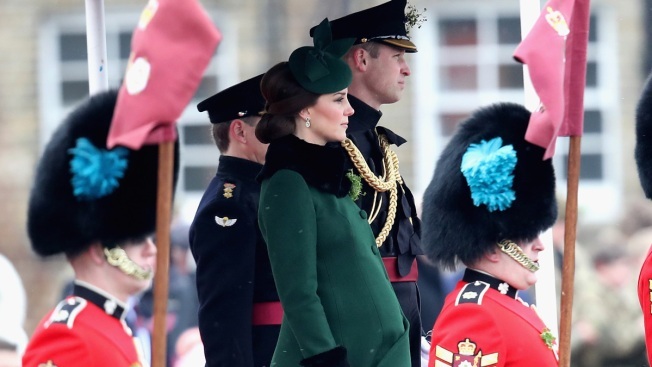 In this March 17, 2018, file photo, Catherine, duchess of Cambridge, and Prince William, duke Of Cambridge, stand on the dais during the annual Irish Guards St Patrick's Day Parade at Cavalry Barracks in Hounslow, England. Like everything to do with Britain's royal family, the birth of Prince William and Kate's third child is governed by a mix of tradition and modernity. For generations it was the custom among royals — as among commoners — to give birth at home. Queen Elizabeth II was born at her grandfather's London house, and gave birth to her sons Charles, Andrew and Edward at Buckingham Palace. Her only daughter, Princess Anne, was born at Clarence House, another royal residence. That changed by the 1980s, when Princess Diana had sons William and Harry at the private Lindo Wing of St. Mary's Hospital in London. William and Kate's children, George and Charlotte, were born at the same hospital in 2013 and 2015, and Kate was admitted Monday in labor with their third. For decades, and for reasons that remain unclear, custom dictated that government officials should be present when a royal was born. Some believe it was to verify that there was no switching at birth or other shenanigans. When the queen was born in 1926, Britain's home secretary was present among the doctors. The custom was eliminated before the birth of the queen's first child, Prince Charles, in 1948. Until recently, it was not usual for fathers to attend births. However, Prince Charles was present when sons William and Harry were born, and William was at his wife's side for the birth of all three of their children. Once Kate gave birth, a messenger traveled by car from the hospital to Buckingham Palace carrying a piece of paper signed by doctors detailing the infant's gender, weight and time of birth (a boy who was 8 pounds, 7 ounces at the 11:01 a.m. British Summer Time birth). The bulletin was posted on a wooden easel on the palace's forecourt for everyone to see. The royal family has moved with the times, though: The news was also announced in an emailed press release and a statement on the palace Twitter account. Most royals have three to four first names, usually in a combination that honors previous monarchs or relatives. William and Kate's eldest child is named George Alexander Louis and his sister Charlotte Elizabeth Diana — honoring both her great-grandmother Queen Elizabeth II and her late grandmother, Princess Diana. Arthur and Albert are among the bookmakers' favorites for the new royal baby boy. 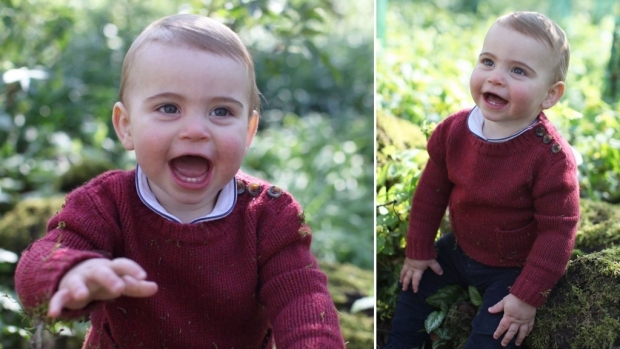 The baby's title will be His Royal Highness Prince (Name) of Cambridge. That means Princess Charlotte will remain fourth in line to the throne, and the new baby will be fifth. William's younger brother, Prince Harry, drops down to sixth place.